Shortly after noon on Fridays, the Rev. Ann Holmes Redding ties on a black headscarf, preparing to pray with her Muslim group on First Hill. 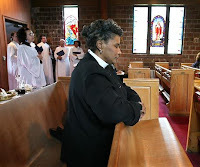 On Sunday mornings, Redding puts on the white collar of an Episcopal priest. She does both, she says, because she's Christian and Muslim. Redding, who until recently was director of faith formation at St. Mark's Episcopal Cathedral, has been a priest for more than 20 years. Now she's ready to tell people that, for the last 15 months, she's also been a Muslim - drawn to the faith after an introduction to Islamic prayers left her profoundly moved. She says she felt an inexplicable call to become Muslim, and to surrender to God - the meaning of the word "Islam." "It wasn't about intellect," she said. "All I know is the calling of my heart to Islam was very much something about my identity and who I am supposed to be. "I could not not be a Muslim." How it happened | In fall 2005, a local Muslim leader gave a talk at the cathedral, then prayed before those attending. Redding was moved. As he dropped to his knees and stretched forward against the floor, it seemed to her that his whole body was involved in surrendering to God. Then in the spring, at a St. Mark's interfaith class, another Muslim leader taught a chanted prayer and led a meditation on opening one's heart. The chanting appealed to the singer in Redding; the meditation spoke to her heart. She began saying the prayer daily. She still doesn't know why that meant she had to become a Muslim. All she knows is "when God gives you an invitation, you don't turn it down." In March 2006, she said her shahada - the profession of faith - testifying that there is only one God and that Mohammed is his messenger. She became a Muslim. Before she took the shahada, she read a lot about Islam. Afterward, she learned from local Muslim leaders, including those in Islam's largest denomination - Sunni - and those in the Sufi mystical tradition of Islam. There were moments when practicing Islam seemed like coming home. Friends who didn't know she was practicing Islam told her she glowed. >> Read the full article here. "Islam doesn't say if you're a Christian, you're not a Muslim" - Ayesha Anderson, Programming director, Al-Islam Center of Seattle.